Lexington Pavement Sweep is a full-service parking lot sweeping and pavement maintenance company. We have been providing the Lexington, Kentucky area with superior vacuum truck cleaning, parking lot maintenance, trash and litter removal and snow removal service since 1990. We make it possible for your parking lot and grounds to start each day fresh and clean. We operate 7 days each week using power vacuum trucks and snow plowing trucks to ensure complete, year-round cleaning and maintenance of your parking lot and grounds. Our state-of-the-art vacuum sweeper trucks can efficiently clear your pavement of all types of trash, litter, rock, glass, leaves and grass, and any other items your visitors may leave behind. We can also restore your sidewalks and entrances to like new condition using high temperature water and detergent to melt away gum, stains, and dirt. 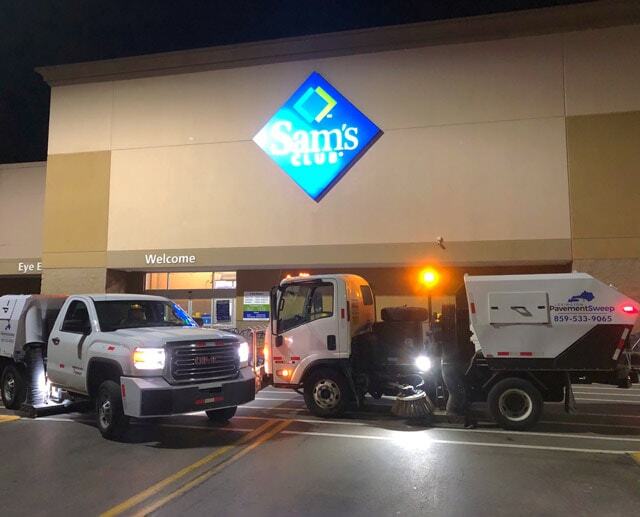 Lexington Pavement Sweep uses extremely quiet, dependable, Nite-Hawk Sweepers to erase the daily abuse customers can afflict on your parking lot. Each truck is equipped with live and recorded GPS to completely verify the arrival and departure of our vehicles on your property. Through proper supervision and our regular property inspections, you can feel confident that your property’s parking lot and pavement will be exceptionally maintained. Contact us today and discover the difference Lexington Pavement Sweep can make with all your parking lot maintenance needs.